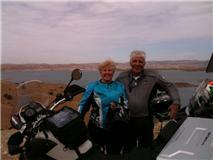 "We began our trip in Seville, Spain with two guides and seven couples on eight motorcycles. A minivan tags along carrying our gear and a spare motorcycle. Our tiny caravan consists of three couples from Rio de Janeiro, one from Canada, two from Sedona, Arizona, plus Bill and me. Our incredibly handsome guide is a newlywed from Portugal named Nuno and our driver is Malcolm, an Argentinean raspberry farmer who supplements the family income leading motorcycle tours four times a year. We are riding BMW 1200 G.S. motorcycles and I would describe the trip as majestic, enlightening and damned difficult. The first day we traveled 200 miles to Menzeh, averaging between 75-80 mph in 106- degree heat. Even with frequent stops and a two-hour lunch, it was a very full day. The second day it was 310 miles to Marrakech. The temperature dropped into the mid-90’s as we crossed the Atlas Mountains but the roads were winding and the terrain challenging. We crossed from Spain to Tangier, Morocco by ferry. What a delightful surprise. Color was everywhere--from the women attired in long dresses with matching head scarves to the men and younger women in colorful shirts, blouses and jeans. I had expected a more traditional society but we encountered only a few older men in long white gandoras. The traffic in Marrakech is something else--lots of traffic circles and streets filled with cars, trucks, motorbikes, bicycles, even horse-driven carriages. The children loved to signal us to rev our engines which resulted in explosions of giggles and waves. After our ride through the mountains, I found myself wishing I was 15 years younger. We were shot. The group took in a bit of nightlife and Bill and I could barely stay awake. and in the evening went to the Djemaa el Fna market which is the busiest and largest market square in the world. There were snake charmers, story tellers, musicians and vendors selling everything from fresh fruit to live chickens. The next morning we rode through the Atlas foothills and into the Sahara Desert. It is still in the 90’s but today we got a bit of rain which we are told is most unusual. We will remain in Eroud and will leave at noon to begin our sojourn in tents, riding camels and experiencing, what we are told, are amazing sunsets. It’s Saturday, September 18th and our seventh day of riding. We’ve switched to 4x4 Land Cruisers to travel from the desert roads over the sand dunes on the way to our tents. Our guides tell us that a previous tour had a tough time over the lava rock and fought to stay upright in the sand. The trip took only 90 minutes but it included some interesting stops. One was to the village of the “Black People.” The village founders were African slaves brought here in the early 1900s. They keep themselves separate from the Moroccans, they’ve intermarried and survive primarily by performing for tourists. There were no women visible on the streets or in the performances. All the music, dance and even the mint tea was served by the village men. We also stopped about 30 miles from the Algerian border where Moroccan solders are quartered to insure that no Algerians slip across. Sound familiar? Our four-wheel Land Cruiser took us over sand dunes, gravel pits, dry lakes, and by 5:00 p.m. we had arrived at our desert bivouac—tents. We immediately mounted camels for a trek among the sand dunes to the top of the erg, which are dunes 22 kilometers long (north to south) and five kilometers wide. The tallest dune is about 500 feet high. As sunset approached we dismounted at the base of one of the tallest dunes, climbed to the top and were served champagne while we sat and watched the sunset. I cannot tell you how magnificent and surreal I found this experience. Then it was back to camp on our camels. and dancing performed by the “Black People” villagers as we sat around a campfire. After we retired to our tents, at 10:30 the generator was turned off and everything went dark as pitch, the only light coming from the half moon in the sky above. What struck me most was the absolute silence: Not a sound was heard. I had trouble falling asleep. It was mystifying. I found the lack of sound almost deafening. But in the morning sound returned with a fury at 6:00 a.m., when our Moroccan camp boss started banging on pans, signaling it was time for us to get up. (More updates as time and internet are available)"
Graceann Deters is the author of Divine Betrayal, available from Amazon in the products directory on our site.